Create fabulous backgrounds with your Spectrum Noir pens and embossing folders for your stamped images! 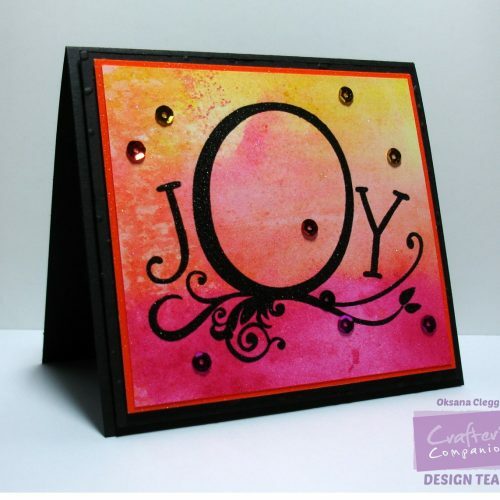 A fabulous stamped card from designer Oksana Clegg, you can make lot of these in one go! Change the stamp and create birthday, wedding and many other cards for different occasions! Step 1. Create a tent fold card blank using Crafter’s Companion Matt Black Card to measure 11.5cm x 10.5cm. Step 2. Using the Spectrum Noir Aqua Pens – Topaz, Amber and Sunset and also a pink watercolour pen, scribble onto an acrylic block. Spritz with water and stamp directly onto white cardstock and allow to dry. Step 3. Dust the card with an anti-static pad. Stamp the ‘JOY’ image onto the card using black ink, heat emboss using clear powder and cut down to 10cm x 9cm. Step 4. Cut some orange card slighter larger to create a mat and adhere together using Collal glue. Step 5. Spray with Iridescent Glitter Varnish and allow to dry. Step 6. Emboss another piece of the same black card using the ‘Snow Embossing Folder’. Create a mat and adhere together using foam pads. Run scissors along the outside edge to create a slight distressed edge and adhere the sequins. Step 7. Adhere to the card blank using Collal 3D glue gel to complete. We would love to see what you make! Share your projects and cards with us on our Facebook page, tag us on Instagram(#crafterscompanion), on Pinterest (@CraftersCompUK) or on Twitter (@CraftersCompUK)! We wish you a very Merry Christmas and a Happy New Year from all of us at CCUK. We hope you are having a lovely day this Christmas Day!